The Days of Johann, an agility dog! : Around the dog-o-sphere! 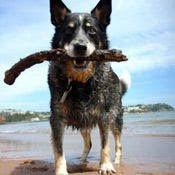 Nice vid from Karen Pryor's site - the basics of tugging with your dog. In this video Aidan teaches you how to play tug with your dog so the game is safe and fun. Nancy Gyes' great article on making and using a homemade tug toy your dog will absolute go mad over. An oldie but a goodie. And of course one of my all time favs, Susan Garrett's wonderful article "How to create a motivating toy" to use in training. For those canine athletes out there, we added a new vid to our Canine Athletes Squidoo lens. 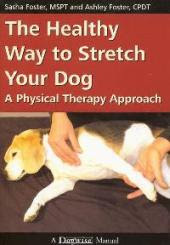 The video has some tips on stretching your dog from the great folks (and my new best friends :) who recently published the book, The Healthy Way to Stretch Your Dog - a Physical Therapy Approach. Here are the new IFCS 2010 US Team Selection Rules from USDAA (pdf). Sue Jones from the UK has a new DVD out entitled, "Well Balanced Pup" which focuses on the ways responsible breeders build strong foundations for their future of their dogs, with care and attention in the early weeks. Sue is not only a breeder, but works with the RSPCA in rehabbing and re-homing homeless dogs. She also has a blog, and more info on her website, including this video. Sue is in the UK, but will sell to those in the US as well. I received an email this morning from Nina Ottosson, the inventor of those wonderful interactive games and puzzles we've been raving about. She wanted me to share info that her toys will be available in Australia beginning sometime after this summer through distributor VCA World. If you are in AUS, bookmark this page and keep an eye out for Nina's great toys. And remember, if you're in the US, find all her toys available here. Clean Run has really beefed up their site and added some great info, news, resources, articles, training exercises and more. Be sure and visit them for all regularly for the great updated info. They are now on Facebook and Twitter, so you can add and follow them to keep up to date with the latest. They've announced info on the 2010 Clean Run Instructors Conference to be held August 5-8, 2010 at the Inn at Chester Springs in Exton, Pennsylvania, click here for info. And don't miss their free worldwide shipping items that change every month! You may want to bookmark this page - it's a listing of all the AKC confirmation events that will be airing on ESPN and Animal Planet. Also the AKC has posted an FAQ document regarding the new Mixed Breed Program. Some answers to questions about how the MB program relates to PAL and FSS, why tracking is not included in the MB program, etc. Surfing around the other day we found a great blog with a couple of posts we wanted to share with you. Positive Dog Training (from Spain) has a few homemade dog toys vids they have posted about that you may find interesting. They also have several posts - Free introductory course to the clicker (be sure and start from the bottom). Here are a couple of vids from Agility Brazil - working on 2o2o with the dogwalk and teeter - nice little tips. I could play with this all day! A magnetic dog agility course set, fun! If you'd like to see who made the Canadian World Team for the FCI World Championships, click here! We picked up a few new trick ideas from these vids, here and here! Check out the new upcoming book from my new Twitter bud, Dusty, a 5-year-old rescued sheltie, and his dad Robert Rodi. He's got a new book coming out about being an agility dog - it's called "Dogged Pursuit: My Year of Competing Dusty, the World's Least Likely Agility Dog". The book will be in stores around June 11, or you can pre-order it here at 25% off! Saw this on Clean Run's Group: You know how much I am a fan of stretching and strengthening after all my injuries. Here is a great vid of pups utilizing an exercise ball to help build their core, strengthen their backs, and more. And you can see my exercise ball vid here! Also check out my Canine Athletes Squidoo lens for more ways to keep your pup running great! The EPA is increasing scrutiny of flea and tick control products for pets - yeah, well, it's a step!!!! The new first pup is certainly on the ball. He has a new book out already - Bo : America's Commander in Leash. Currently it's sold out, but check back, I'm sure they'll get more. Here's an interesting article from MSNBC the other day: Raw deal? Some feed their pets uncooked diet. Some say yes, some say no! Relatedly, I found it interesting that the castaway dog that was recently found, reverted to his instinct and dined on raw wild goats while living on the deserted island. Looks like only $1M of the massive Helmsley estate is going to the dogs. Here's a list of the 10 $100K grants that animal and dog welfare organizations will be receiving. There are tons of pet pantries cropping up all over the country to help needy families with their pets. If you, or someone you know, is having trouble feeding their pets in this tough economy, help them by doing a Google search for 'pet pantry'. There is sure to be someone local that can help them. And there are also lots of organizations that can help needy families with pet care, as well. Google search for that, too, if you know someone in need. If you are a rescue organization, The Meow Bow Wow Fund will reimburse qualifying non-profit rescue organizations for the spaying and/or neutering of adoptable dogs and/or cats and for the vaccination of dogs and/or cats commensurate with requirements for adoption. More info. After all the reports from pet owners about Nutro foods, the FDA is finally confirming a probe of NUTRO Pet Food and related deaths and illnesses. Read more. If you live in the Chicago area, this is a not to be missed event. The Shedd Aquarium's has a new show now through most of May - Pet Training the Shedd Way w/rescues! It's the brain child of Karen Prior friend, Ken Ramirez, clicker trainer extraordinaire, and trainer to the dolphins, big cats, whales and more, as he oversees the daily training programs for the entire animal collection at Shedd. Casting Call: In South Florida or Boston? Try out for "Fetch Me a Beer" new dog trick reality show from Animal Planet, coming this fall, starring Zak George of YouTube fame. From the Seattle Times: Hmmmm....Got a devil dog? Try the Russian Dog Wizard? Amazing advances going on in animal care. Check out Cassidy! One of the 1st pups in the country w with a permanent prosthetic artificial leg. Great interview with Michael Schaffer, author of the new book "One Nation Under Dog" from NPRnews. Press 'listen now' to hear the interview. 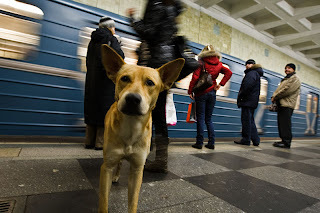 And last, but certainly not least, I just had to share this story - The Amazing Story of The Moscow Subway Stray Dogs. They are so smart!!! Dusty (and Rob!) are training buddies of ours - can't wait to read their book! Give your dog VitaLife duck and sweet potato dog treats. These tasty rewards are made with a perfectly blended recipe of natural ingredients. There is absolutely no artificial colors, preservatives, corn or wheat. These delicious treats are ideal for all breeds of dogs.